VILLA KRIM – TOP 25 BEST WINES OF UKRAINE! 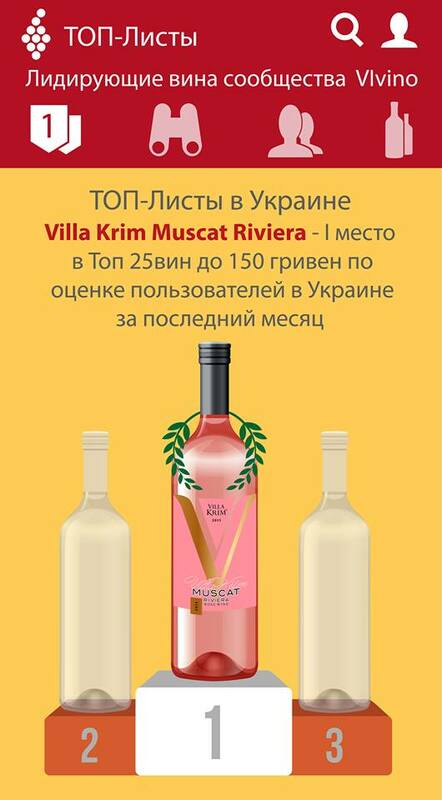 Thanks to the use of modern technologies, namely mobile apps, which have already replaced simple reviews in the Internet, we are proud to inform you that universally liked Muscat Riviera wine of TM Villa Krim justifiably took the first place in the TOP rating of the best wines up to UAH 150 by consumer reviews, according to users of Vivino international app. Today Vivino app contains more than 500,000 wines, which is almost 15,000 winemakers, 800 regions and 48 countries.